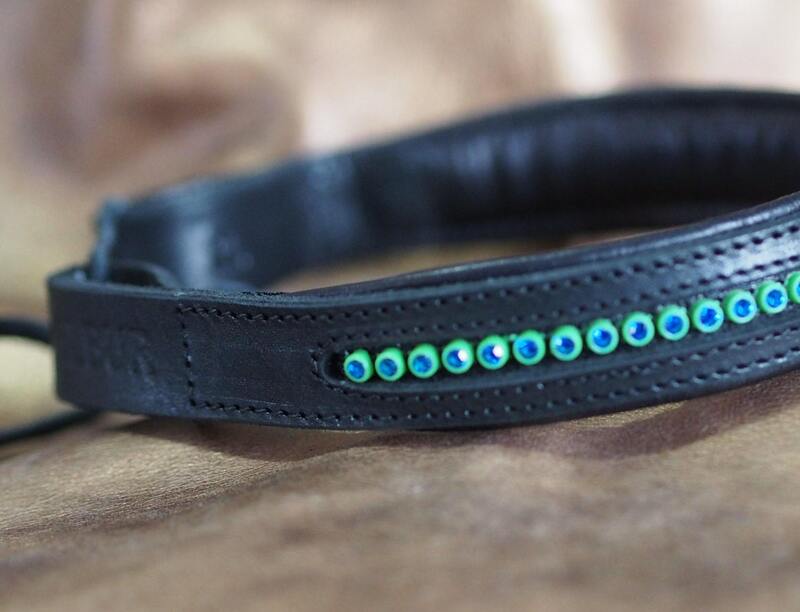 This black leather dressage/show brow band is made with fine polished cowhide and lambskin wrapped padded brow liner, and inset with one rows of Preciosa Czech rhinestone chain with 14 color options! 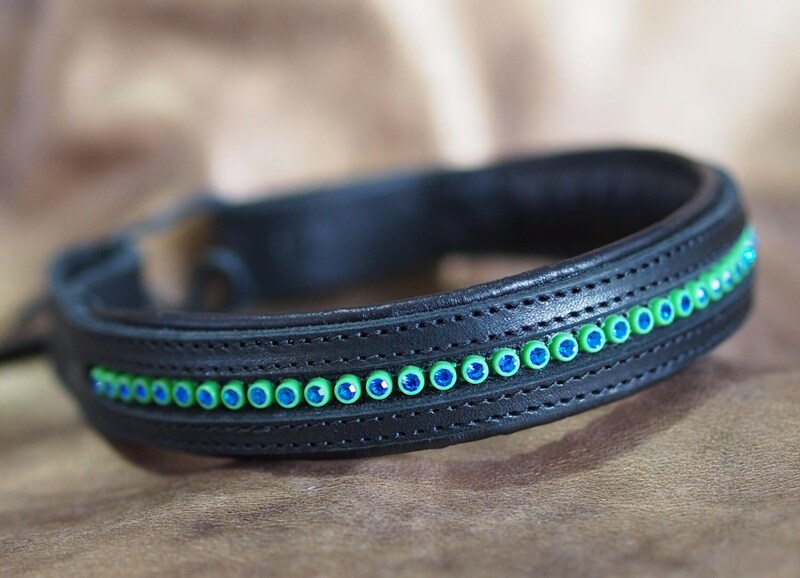 The band is top quality cowhide, approximately 3/4" wide with a 1/4" x ~10" area open to show the row of rhinestones within, and all edges of the main band are beveled for clean finish. The lambskin wrapped padding is slightly wider to provide a slight reveal. I use plastic banded Preciosa Czech rhinestones, as they are tougher and easier to care for than traditional cup and prong style rhinestone settings, as there's nothing for hair or other items to catch on, and no prongs that can be pulled loose, which can lead to lost stones! The rhinestone chains are hand sewn to a strong goatskin, which is glued to the lambskin wrapped Landau closed cell foam padding. The main band is then glued and stitched to the padding so that it frames the rhinestones and secures all layers together. 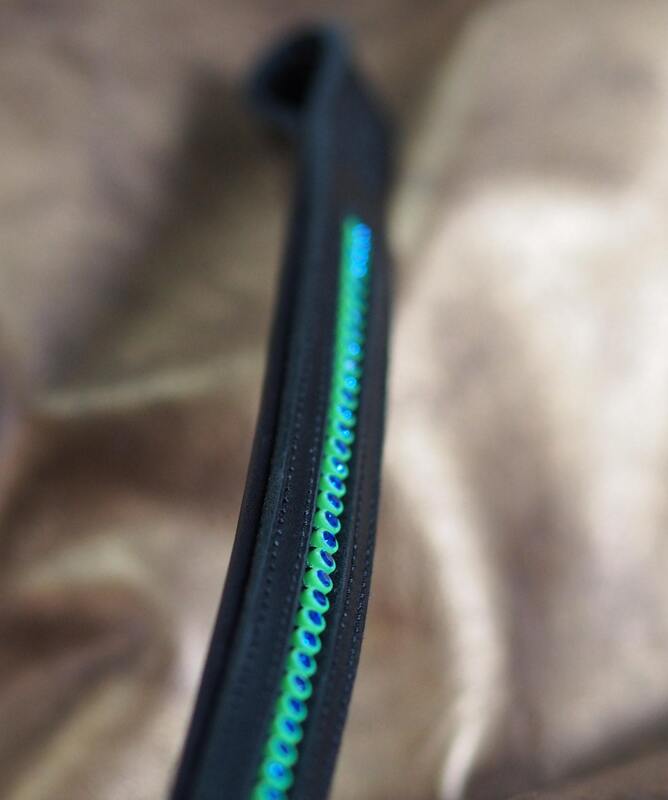 The loop for the headstall is glued and secured with this same stitching, too. This listing is for a black band with one row of rhinestone chain, and currently offer 16 color options for the rhinestone chain, which are listed as the BANDING surrounding the stone, and the STONE color. The band in the photos has the green/blue option. The order is the same as one my sample board, if you've seen that at a show. The photo tries to capture the colors for the options (all but black/crystal at this time), but please email me if you want detail photos of a specific color choice (since I can't list a photo detailing each option in this listing). Or you can search for the size SS18 Preciosa plastic banded rhinestone chain--and if you find you really want one of the few color options I don't list, please request it! 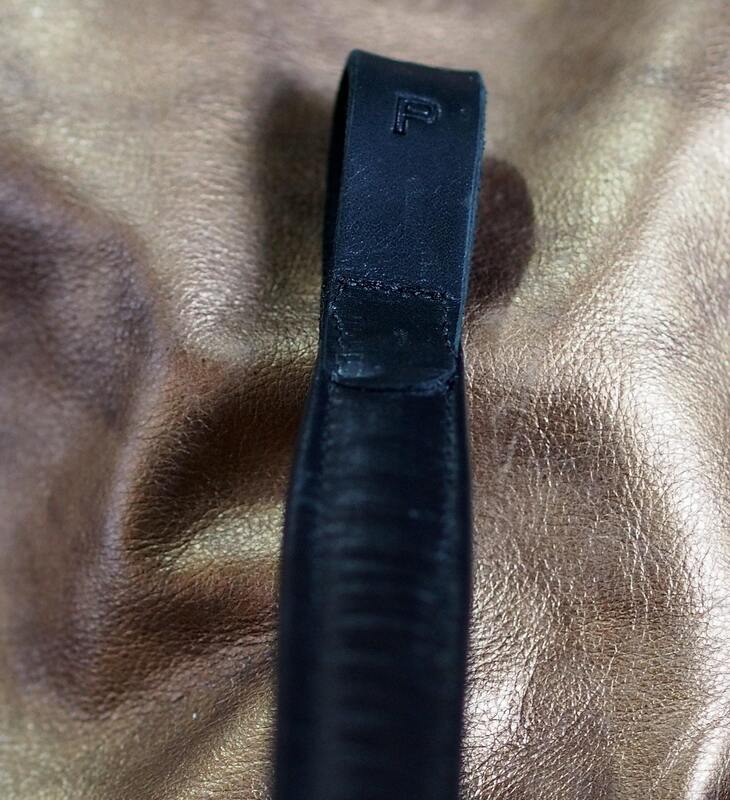 The sizing is based on traditional brow band dimensions for Pony, Cob, Full, and Warmblood, but customization is always an option if your horse needs another size, as I make all of this in my studio, so can choose the leathers and cuts and stones used.